Rose Sicka knew exactly what to expect when she went to the Nebraska State Museum on Sunday. A pair of Burmese pythons -- about 200 pounds each -- flicked their tongues at the 7-year-old as she entered Elephant Hall. Rose was excited to pet the massive pythons' pale yellow scales. Her mom, Amy Sicka, on the other hand, wasn't so thrilled. 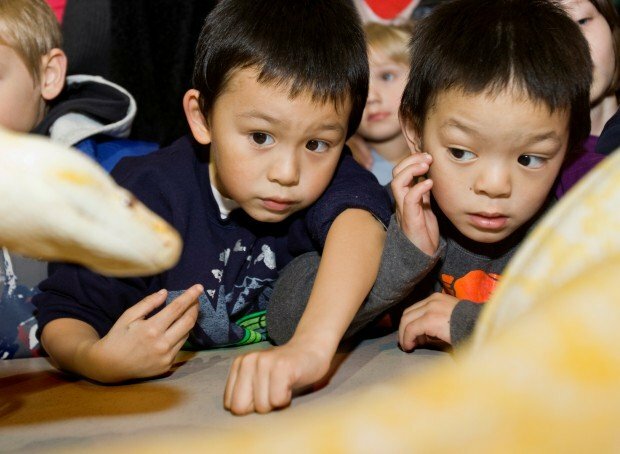 "They were so smooth," said Rose, who was one of 400 children and parents brave enough to experience "Snakes (Past and Present)" at this month's Sunday with a Scientist. 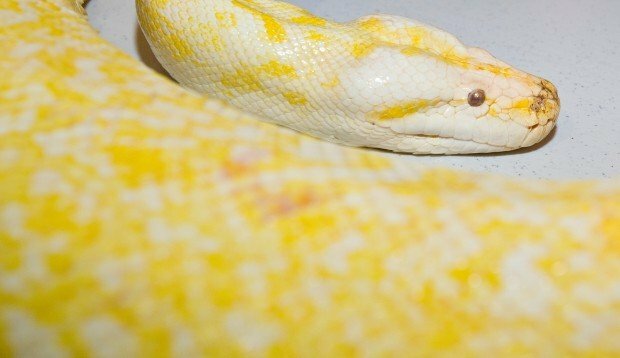 Because of their size -- and their diet of two chickens a week -- the pythons aren't kept in the lab at the University of Nebraska-Lincoln, said Dennis Ferraro, associate professor of herpetology. The snakes are on loan from Wildlife Encounters, a Gretna-based nonprofit that takes animal education programs to schools across the United States. In addition to the pythons, smaller native snakes such as the tree-climbing Western black snake were on display. "Usually, these snakes would be hibernating below the freeze zone at this time of year," Ferarro said. "So it's great that kids can come see them here." While he focused on the present, Jason Head, assistant professor of Earth and Atmospheric Sciences, focused on the past. Head has traveled the world collecting ancient snake fossils, a few of which he had on display Sunday. "This is a vertebrae from the largest species of snake to ever exist, Titanoboa," he said, holding a bone the size of a softball. To put the snake's size in perspective, he showed vertebrae of a common 6-foot snake -- about the size of a pencil eraser. With bones this large, he said, the snake reached 50 feet in length and weighed a nearly a ton. Sunday with a Scientist events take place the third Sunday of each month, with topics ranging from robots to bees to biofuels. "It's an informal opportunity for kids to learn from the scientists," said Kathy French, education coordinator at the museum. "Anytime you can get kids interested in natural history, it's a good cause," Head said. "This is how doctors and scientists are made."